Now I know this post is old, but I hope you can reply to one question. I’m trying to change the Certificate that I used to Encrypt a database with. That way I can create new Certificates and expire old one. Any information on that? Look at Perry’s reply, as he actually answered your question. Perfect, I will be testing this today. Thanks to both of you. Tested, it works perfectly thank you! According to the post, I need to restore the Master Key from Server1 to Server2 and I’m having trouble understanding why. My best guess is that the Master Key encrypts the Certificate so it is best to restore it from Server1 to have the Certificate encrypted in the same way. Is that right? Seems more like a best practice approach but at the same time, should I have the same Master Key across different servers? 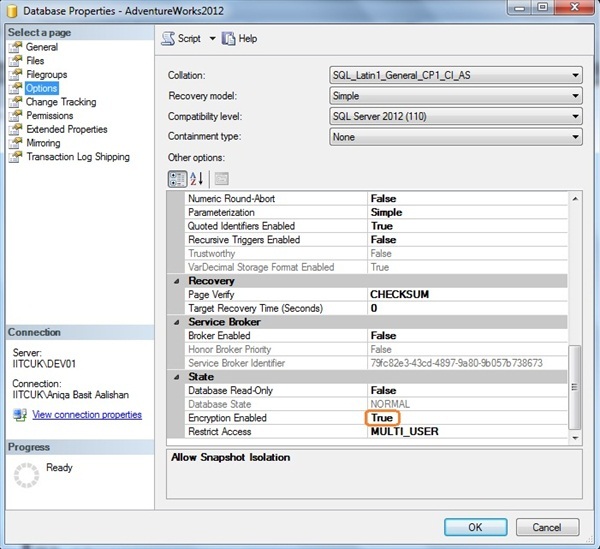 This TechNet article discusses creating a new Master Key on the new server and not restoring it. I agree with you. Although, I prefer to use the same master key. I also backup the master key and certificate for DR scenario. there is no security best practice related to this topic. You DO NOT need to backup and restore the DMK! The SMK and DMK sit at the top of the SQL Server encryption hierarchy and the TDE cert has no direct dependency on either of these. The DMK merely encrypts the Certs private key while it is stored on the instance. When the Cert is backed up away from the server the private is then encrypted with a password. 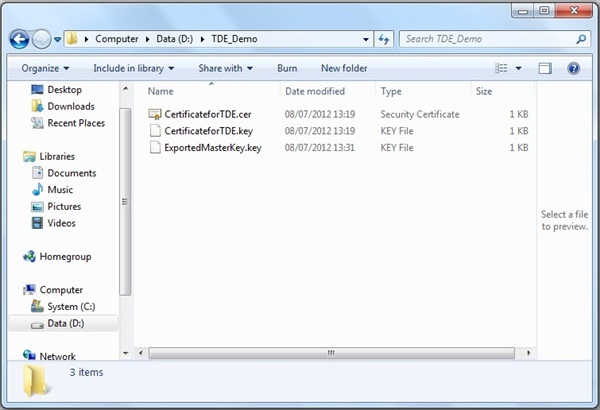 To move a TDE protected database to a new server you only need the database backup file, the cert backup file and password and permission to create said objects. So let me throw this scenario out there. I take my Cert on Server1 and Encrypt DB1. Then I create a new Database Master Key on Server2 and I take my Cert from Server1 and put it on Server2 and then I restore DB1 on there. Out of forgetfulness I did not backup the DMK on Server2, that will not affect my Encrypted DB1 and will not affect my Cert correct? So if I wanted to take DB1 off of Server2 and restore it to Server3 then all I need is the Certificate with the Private key and the password for that Private key to restore the Cert onto Server3? I don’t want to have to keep backups of all the DMKs across servers. Of course I will keep my Cert and Private key file safe with a strong password and that is all I want to rely on to restore the Encrypted DB. I understand better now. So if I use separate Master Keys I would need to back them up as well, and store them securely. If I use the same Master keys then I just need one backup to be stored securely for multiple servers. More like a management strategy. I actually like your way better, and since I’m in the early implementation phase it won’t be hard to put it to practice. Thanks for your help! 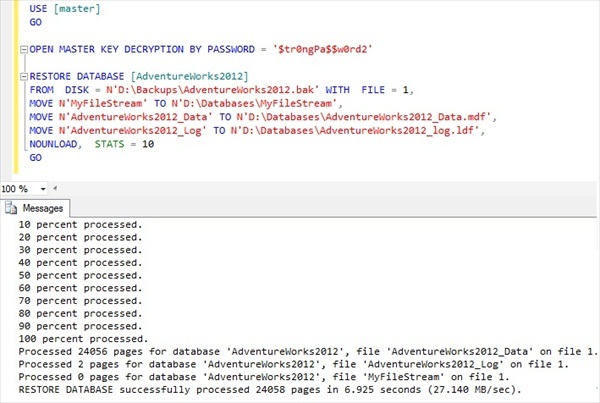 the DMK is immaterial between instances it’s just a key created and encrypted by supplying a user defined password. 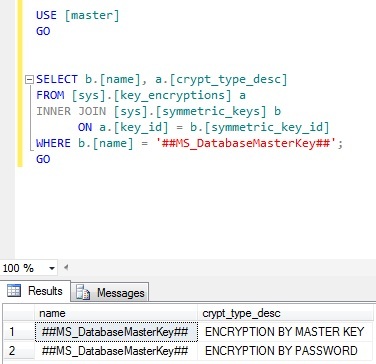 The DMKs primary function is to protect the private keys of any certs or asymmetric keys that are stored on the SQL Server instance. The SMK and DMK are of no relevance between instances. I wrote this out before your other reply. I think I got it now. As long as my Cert and the PrivateKey+Password are in a safe place then I’m good. 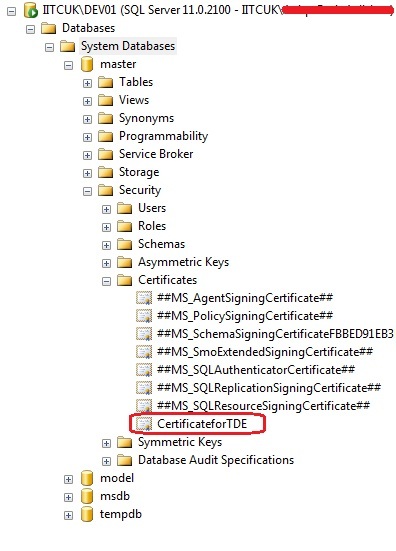 Who can backup the Certificate from SQL, I am trying to do a security analysis of if someone gained access to our SQL machine – could they backup the database and certificate ? What rights would they need – sysadmin, diskadmin, serveradmin ? Who has access to backup certificates and can you prevent backing up certificates after they have been backed up once? 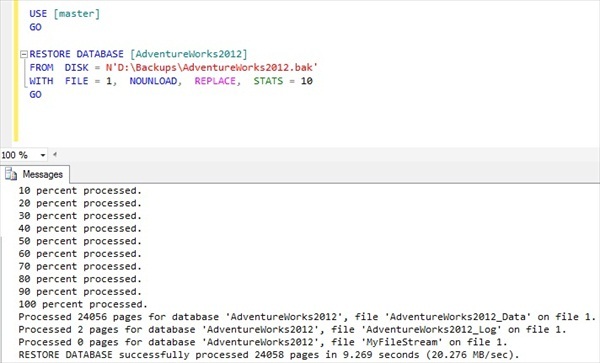 My example is someone gains access to your SQL box and that account has sysadmin, backs up the database and backs up the certificate (public/private) then has access to your data. So 2 questions, what server roles have access to backup certificates, second question can you prevent the private key from being backed up after 1st backup (put in some security vault).